Kelli Walker wasn't able to get into her family's home, on the other side of the brick wall, because of the depth of the rising floodwater in Houston on Tuesday. Here are three reasons Houston was, in the words of one expert, a "sitting duck" for catastrophic flooding. 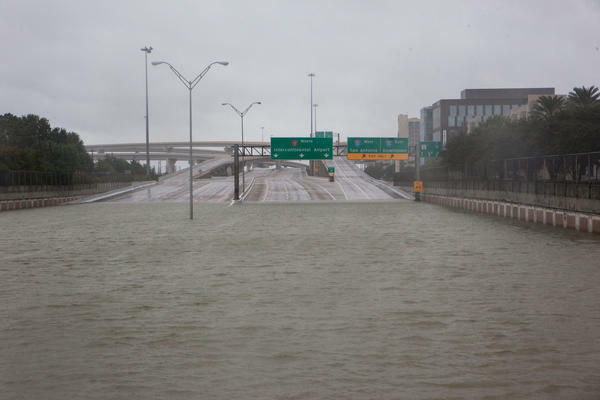 Houston sits just under 50 feet above sea level and is among the flattest major metropolitan areas in the U.S. "We have a slope that is less than one foot per mile," says Phil Bedient, who teaches civil and environmental engineering at Rice University. "And because of that, we have very slow draining systems." That system consists of natural bayous and man-made channels that funnel water from west to east to flow out of the city and into Galveston Bay. Bedient says such a gradual slope doesn't allow for floodwaters to move fast enough, so it backs up into nearby streets, parking lots, homes and buildings. 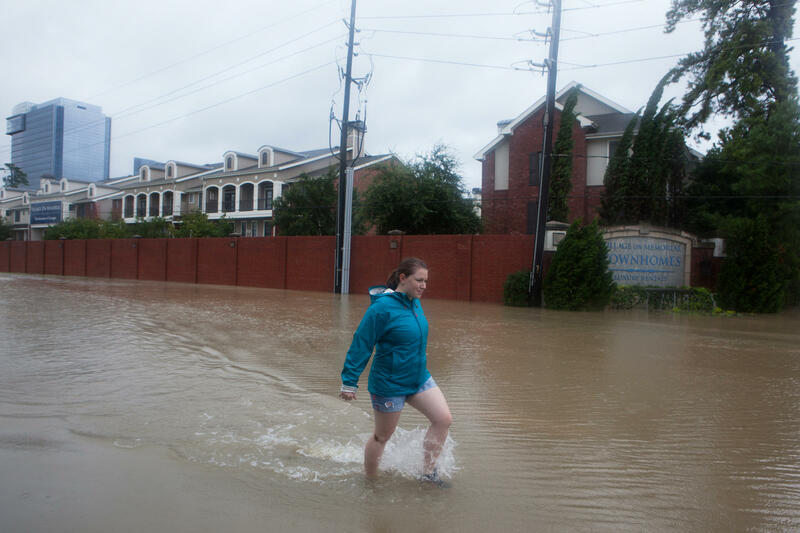 "The stormwater drainage system is in desperate need of updating," Sam Brody, a professor at Texas A&M, Galveston, told NPR's Morning Edition on Wednesday. Brody specializes in natural hazard mitigation. He and others in his field point to old and inadequate drains and pipes that can handle at most 1 to 1 1/2 inches of rain per hour. Hurricane Harvey's deluge overwhelmed them. 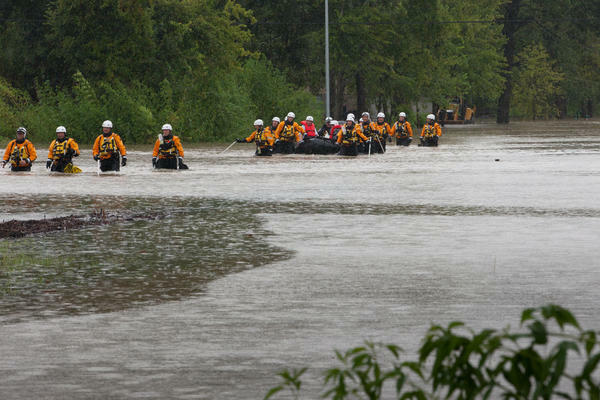 Many of the area's bayous are too small to even handle Houston's frequent heavy rainstorms. The main bayou through downtown, Buffalo Bayou, "is pretty much still a dirt mud channel like you would have seen 100 years ago," U.S. Geological Survey hydrologist Jeff East told The Associated Press. Some of the bayous can handle only 10-year storms. That means there's a 10 percent chance of a storm meeting or exceeding that capacity in any given year, explains Joe Schofer, a civil engineering professor at Northwestern University. "That's a really high probability. If you were buying lottery tickets with a 10 percent chance, that would be a good way to get rich," he says. "What you're saying is you're planning to be overwhelmed by a storm that is relatively high probability." Expanding the bayous to increase their capacity is difficult because the county didn't leave enough room around them for widening. Where they can be widened, projects have been slow and inadequate, according to Rice University's Bedient. Houston's population has exploded in recent years. At nearly 2.4 million people, it is now the fourth largest city in the country. If you include the rest of surrounding Harris County, that number goes up to more than 4.5 million. "When you've got rapid growth and development, along with that comes roadways, rooftops, and parking lots," says Brody. Because Houston lacks a zoning code, builders aren't required to use flood mitigation techniques like green areas to absorb rainwater or retention ponds for runoff. According to Brody, "all of that impervious surface makes it very difficult for the water to drain into the soil. Instead, it runs into the bayous and, in this case, into people's homes." "That compromises the natural infrastructure of this very flat and low-lying landscape, making it difficult for the water to absorb and be held by the prairie and the wetlands, and slowly release into Galveston Bay." "It's not reasonable or fair to say, 'You people in Houston could have done a better job and it's too bad you're going through this,' " Northwestern's Schofer says. "Harvey's an opportunity, when it's all done and everything is dried out, to step back and say what can we do to protect ourselves in the future because there will be a future. This kind of thing will happen again." Going back into developed areas to retrofit stormwater systems and adding green space will be difficult, but Rice's Bedient says the government should seriously consider buying out homes and businesses that are flooding over and over again and turning those areas into retention ponds. "We're so flat and the drainage is so slow in many areas that we should consider the idea of holding some of this stormwater back and then pumping it out at a later time," he says. Brody says the discussion needs to also go beyond engineering and to policies on a regional scale "and look at where we're putting people, pavement and structures in relation to flood vulnerability." "We need to invest in protection and we need to put resources against this so we don't suffer these damages in the future," says Schofer, who notes that similar ideas were discussed and then dropped after Hurricane Katrina, Superstorm Sandy and other flooding disasters. "It's really too easy to lose the momentum a year or two or three after the storm and to not make the sacrifices really to buy and build the infrastructure that gives us some protection against a storm of this magnitude." "The pattern is really clear," Schofer says. "It doesn't make sense to ignore this in the aftermath and fail to build the protection we really need."